At my cousin's house warming party, he had many traditional Filipino dishes laid out on a table. To me, its nice eating these typical Filipino foods at parties like pancit, barbecue, dinuguan, puto, etc. Then there are times when I'm not excited seeing the same party foods again. When I looked around the kitchen, I saw something out of the ordinary. One of my in-laws was near the stove watching two big covered pots that were simmering. I found out he was making the goat soup called sinampalukang kambing! 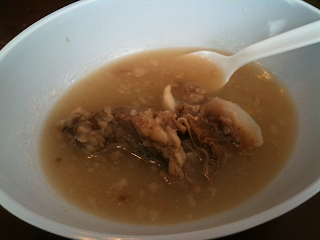 One way of making sinampalukang kambing is with a sour broth consisting of sampaloc (tamarind), sampaloc flowers or leaves, a goat's head, leg, and/or some meat, onions, celery, salt, pepper, and MSG. My relative had made his own sour and bitter version of the soup. I only tried the sour version (I'll try anything but bitter foods!) and it left me satisfied! I liked how it was tasty due to being slightly sour and suety.